Xiaomi Mi recently announced their launch of new lineup of Android Smartphones devices which includes Redmi Note and Redmi Note 4G. After successful sales of Mi3 and Redmi 1S in India on Flipkart, at last Xiaomi announced their latest devices for which Xiaomi Fans in India were waiting eagerly for its release from long. The launching news about Redmi Note and Redmi Note 4G in India was officially updated on Xiaomi Mi India Official Facebook, Twitter and Google+ networks. As Flipkart is the official reseller of Xiaomi Mi devices in India, Flipkart have added these two variety of smartphones Redmi Note and Redmi Note 4G on its store page of Mi from where the user who wants to buy Redmi Note or Redmi Note 4G can register himself/ herself to buy it on the flash sales conducted on due dates. 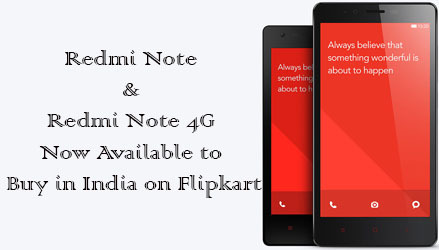 To register yourself to buy Redmi Note or Redmi Note 4G click here.